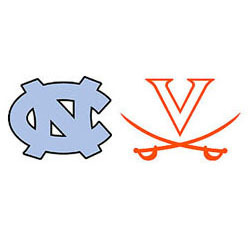 #23 UVA scored a season-low 41 in a blowout loss nine days ago at UNC. Then the Cavs returned the favor Monday night in Charlottesville. The fifth-ranked Tar Heels were held to a 38-year low in the 53-43 defeat. The last time a Carolina team was this anemic in a game was way, way back in 1979, back before three-point lines, before shot clocks, back when Dean Smith would close out wins with the Four Corners. What was different from a 65-41 UNC beatdown of Virginia on Feb. 18 and the reversal of fortune Monday night? Justin Jackson: The 6’8” junior had 20 points on 7-of-14 shooting down in Chapel Hill, going 4-of-8 from three-point range. Jackson, with UVA point guard London Perrantes in his grill all night Monday, had just seven on 3-of-10 shooting, and was 1-of-6 from three, this time around. The post guys: Seniors Kennedy Meeks and Isaiah Hicks were coolly efficient in the UNC win. Meeks had 13 points on 6-of-10 shooting and seven rebounds, and Hicks had 10 on 5-of-7 shooting and eight rebounds. On Monday, Meeks went for six points on 3-of-8 shooting with seven rebounds, and Hicks had two on 1-of-3 shooting with three rebounds before fouling out. The boards: UVA coach Tony Bennett started a four-guard lineup with Isaiah Wilkins limited to 22 minutes off the bench due to the lingering effects of strep throat. And yet the Cavs were outrebounded only 38-35 by the ACC’s best rebounding team (margin coming in: +13.6 rebounds per game), and Virginia actually outperformed Carolina on the offensive glass, 13-10. Carolina was the league’s best offensive-rebounding team coming in. Virginia had a modest 14-11 advantage in second-chance points, but considering the opponent, which had had a 44-26 edge on the boards on Feb. 18, the effort and results here were huge. Turnovers: The Pack-Line defense isn’t designed to force turnovers, but rather bad shots, and defensive rebounds. Carolina had 12 turnovers in the first half, a factor in why the Heels were down four at the break despite shooting 47.1 percent. They limited the damage in the second half, committing just two turnovers, but only shot 27.6 percent from the floor in the final 20 minutes (8-of-29), and made just one of their last 12 shots from the floor. On Feb. 18, the Heels shot 46.6 percent, had just nine turnovers and scored 1.032 points per possession. Monday, the totals were 35.4 percent, 14 turnovers and .754 points per possession. Kyle Guy: I saved the best for last here. Guy was almost literally a non-factor at Chapel Hill, going scoreless on 0-of-5 shooting with one assist in 13 minutes. The freshman was the microwave on Monday, going for 17 on 6-of-11 shooting, including 5-of-7 from three, with four assists in 32 minutes. His hot shooting was almost entirely the difference offensively. In the loss on Tobacco Road, Virginia shot 27.8 percent (15-of-54), improving only marginally to 32.2 percent (19-of-59) on Monday. The difference was the shooting from long-range. UVA was 2-of-20 from behind the arc nine days ago, and 10-of-24 on Monday night.